If our greatest purpose as a Church is to love the Lord our God, which Jesus identified as the Greatest Commandment, then all we do with all of our heart, soul, mind, and strength should be because of and for Him. If we all remember that, then ministry is no longer about pleasing ourselves, following our own agendas, or appeasing other people. Love for God provides great motivation for doing ministry together in a coordinated way. Why? Love for God provides motivation for us to follow His design for the Church which means coordination. God designed the Church like a Body which has many parts that work together as a coordinated whole. — “Just as a body, though one, has many parts, but all its many parts form one body, so it is with Christ.” (1 Cor. 12:12) His intent is that “there should be no division in the body, but that its parts should have equal concern for each other” (1 Cor. 12:25). A lone ranger mentality in the Church goes against His design which involves interdependence, not independence. How can we say we love God and then do our own thing rather than follow His desire? Love for God motivates us to submit to the One He placed as Head of the Church (Eph. 1:22-23; 5:23). 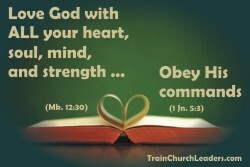 How can we claim our church purpose to be loving God if we don’t follow His commands? Keep people accountable to the big picture, to their greatest purpose, of doing what they do out of love for God. Emphasize this inward motivation over outward conformity and love for God should push them in the direction of being the Church of HIS design, not their personal desires.